Chinese researchers have developed new nanowires with rapid infrared light (IR) response and high carrier mobility, which could enable high-speed communication. Their discoveries were reported in Nature Communications on April 10th, 2019. Currently, effective optical communications employ 1550 nm IR, which is obtained and converted into an electrical signal for computer processing. Therefore, rapid light-to-electrical conversion is necessary for high-speed communications. According to quantum theory, 1550 nm IR has an energy of approximately 0.8 eV and can only be detected by semiconductors with bandgaps below 0.8 eV, for example, germanium (0.66 eV) and III-V compound materials, for example, InxGa1−xSb (0.17–0.73 eV) and InxGa1−xAs (0.35–1.42 eV). However, those materials typically have large crystal defects, which cause considerable degradation of photoresponse performance. 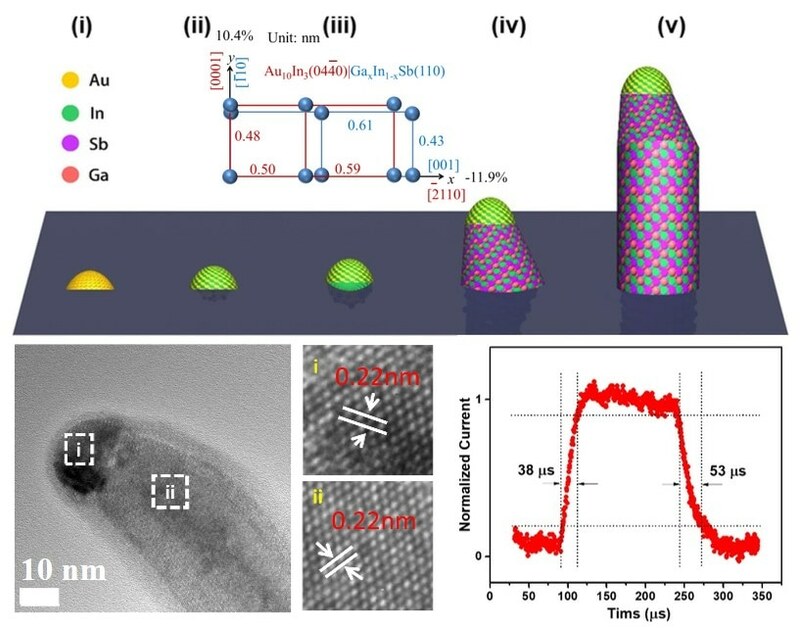 Researchers from the Institute of Process Engineering (IPE) of the Chinese Academy of Sciences, City University of Hong Kong (CityU), and their partners produced highly crystalline ternary In0.28Ga0.72Sb nanowires to show high carrier mobility and quick IR response. In this research, the In0.28Ga0.72Sb nanowires (bandgap 0.69 eV) exhibit a high responsivity of 6000 A/W to IR with a high response time of 38 ms and decay time of 53 ms, which are some of the top times until now. According to Prof. Johnny C. Ho from CityU, the rapid IR response speed can be related to the reduced crystal defects, as also demonstrated by high hole mobility of up to 200 cm2/Vs. The reduced crystal defect is obtained by a “catalyst epitaxy technology” first demonstrated by Ho’s team. In a nutshell, the III-V compound nanowires are catalytically developed by a metal catalyst like nickel, gold, and so on. These catalyst nanoparticles play a key role in nanowire growth as the nanowires are synthesized layer by layer with the atoms well aligned with those in the catalyst. HAN Ning, Study Senior Author and Professor, IPE.